A rocket born of American and Russian space technology sailed smoothly through its maiden voyage on Wednesday evening, bucking the recent trend of misfortune during inaugural launches. With an Earth-shaking roar, Lockheed Martin's first Atlas 3 rocket fired away from Cape Canaveral Air Force Station's pad 36B at 7:10 p.m. EDT (2310 GMT), embarking on a 29-minute trip to successfully place a European telecommunications satellite in space. The launch was historic, not only because it was the debut for Atlas 3, but it also marked a milestone in post-Cold War relations between the United States and Russia. Never before had a Russian-built engine powered an American rocket to space. The Atlas 3 rocket is the product of engineering with roots in the countries' military weapons that were once aimed to annihilate the enemy. What makes this rocket unique is the powerful engine that blasted it skyward -- the Russian-made RD-180. The Atlas' family tree traces back to the 1950s as Intercontinental Ballistic Missiles pointed at the Soviet Union. The RD-180 was designed by NPO Energomash using engine technology with heritage that dates to the Soviet missiles of the Cold War. Wednesday's mission was conducted in the name of business -- the lucrative commercial satellite launching business. That is why Lockheed Martin sunk $300 million into developing the Atlas 3 rocket. Because satellites are becoming heavier and larger, the rockets that launch them into Earth orbit must grow, too. So Lockheed Martin went to the drawing board to create the Atlas 3A rocket flown Wednesday and its slightly more powerful sister -- the Atlas 3B to debut next year. Both of which can loft more cargo to orbit than the older Atlas 2 series of vehicles flying since 1991. The Atlas 3A can launch 8,950 pounds and the later Atlas 3B will lift 9,920 pounds to the egg-shaped orbit needed by a commercial communications satellite. 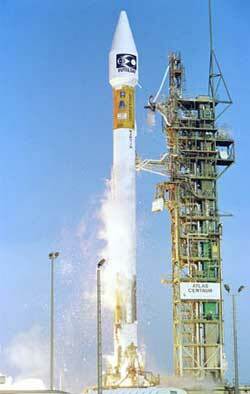 Previously, the best an Atlas could do was 8,200 pounds using an Atlas 2AS vehicle. And looking even further, the company will use the expected 12 to 18 Atlas 3 launches over the next few years as an evolutionary stepping stone to the next-generation Atlas 5 family of rockets that will help revolutionize American space efforts. The Atlas 5s will also use the RD-180, and Lockheed Martin has ordered 101 engines valued at $1 billion. Each $10 million RD-180 has two thrust chambers and two bell-shaped nozzles that swivel during the launch to steer the rocket. The engine produces 933,400 pounds of ground-shaking thrust. It can be throttled up and down to ease the stresses the rocket experiences throughout the three minutes and two seconds the engine will be fired during a typical launch. The debut of Atlas 3 was slated for last summer but the original customer -- Loral Space and Communications -- pulled out because of ongoing concerns with the rocket's upper stage engine. Nearly a year later, the rocket was finally ready to fly with its new passenger: Eutelsat's W4 communications satellite. But liftoff was stalled the last 10 days by a mixed bag of faulty tracking equipment, gremlins in launch pad valves, pesky stray boats intruding inside the restricted waters off Cape Canaveral and even a wayward airplane. Wednesday's countdown was delayed 91 minutes by minor glitches at pad 36B that held up fueling the rocket, a tiny fishing boat just 100 yards off the Cape coastline that refused to leave until being scared away by an Air Force chopper and a slow-moving plane that wouldn't respond to air traffic controls to clear the restricted airspace. But finally, with all the stars properly aligned, the RD-180 engine fired to life and the rocket leaped from its launch pad. Moments after clearing the tower, the engine throttled up and the Atlas zoomed into the evening sky, accelerating much faster than previous incarnations of the venerable rocket design. 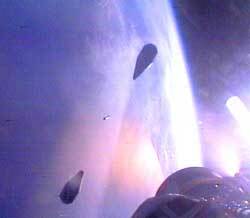 Two onboard video cameras provided dazzling views as Earth receded, causing giddy officials at the Cape to break into applause several times as the rocket passed each critical launch milestone, one after another. The RD-180 appeared to work flawlessly, gulping a ton of liquid oxygen per second and burning up its entire load of fuel in only three minutes. Just over 12 minutes into flight, the Centaur upper stage and attached Eutelsat W4 satellite reached a preliminary parking orbit around Earth. 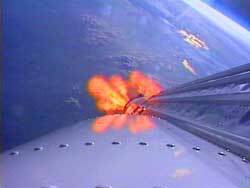 The duo coasted for about 10 minutes before the stage's single Pratt & Whitney RL-10 engine restarted to complete the journey. Less than 29 minutes after liftoff, the Alcatel Space-built W4 satellite was released into orbit while flying high above the Central Atlantic Ocean just west of the African coastline. Ground controllers established contact with the satellite within minutes, confirming its health and placement into the right orbit. "It was wonderful, it was powerful, it was fantastic," said Raffi Mussalin, an official from Eutelsat in attendance for the launch. 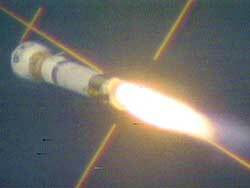 "We were very courageous and now we can state that we had the wisdom to take the ride of this first Atlas (3) launch." Over the next month, W4 will be maneuvered into its final orbit 22,300 miles high, parking itself at 36 degrees East above the Equator, and undergoing a series of tests. Eutelsat will press the satellite into service in June to relay direct-to-home digital television programming and Internet services to Russia and digital pay TV and business communications to sub-Saharan Africa. Paris-based Eutelsat has five more spacecraft currently under construction, all of which are slated for launches in the next two years, to expand the international consortium's orbiting satellite fleet and replace aging craft.